Find pictures of Wickiup and discover interesting facts and information about the Wickiup. The Wickiup was the name of typical dome-shaped structure used as a shelter or house style that was built by many tribes of the Southwest Native American group and other tribes living in the Great Basin region. What does the word Wickiup mean? Definition: The word 'Wickiup' derives from the Algonquian word 'wikiyap' meaning "dwelling, house". The wickiup, mistakenly referred to as a wigwam or 'wetu', was a form of shelter and home used by various Native American Indian tribes, notably those who lived in the Southwest in the states of Arizona, New Mexico, Texas and in the Great Basin. The wikiup was a small, round, dome shape structure made using a frame of thin poles that were covered with brush, grass, reeds, mats or any other materials that were available and lashed together with tough yucca fibers. Sometimes the domed-shaped wickiups were built over a 2 - 3 foot foundation. Bark and sometimes earth was added to the covering of the wickiup to keep out the cold. 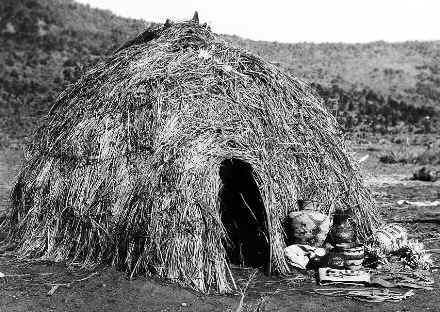 Who lived in a Wickiup? The Wickiup was generally used as a shelter by some of the nomadic Native Indian Tribes who inhabited the Southwest and the Great Basin region. The names of the tribes who lived in the Wickiup style shelter included the southern Apache, and the Great Basin Paiute, Washoe, Goshute and Bannock. Why was the Wickiup built as a Native Indian shelter or house style? Every tribe choose a type of housing to suit their lifestyle, the climate, the environment and the natural resources (known as biomes) that were available to them. The Wickiup was chosen as the most suitable type of shelter because it suited the lifestyle of the tribes who lived in the southwest areas, was easy to build and made use of the grasses and brush-land found in their habitat. These types of wickiup homes were used as both temporary and permanent shelters. However simple, quick and basic pyramid shaped brush shelters, made from poles that were leaned and tied together were also used for southwest hunting trips. How was a Southwest Wickiup built? The picture shows the frame of an Apache wickiup. To make this type of wickiup long, thin poles of flexible willow or oak saplings were gathered, cut to size and stripped of bark. Suitable flat land was selected and cleared of brush and a circle was traced indicating the position of the wikiup. A digging stick was used to create holes at regular, one foot intervals around the circle. The poles were placed firmly in the holes then bent in an arch to form the dome shape of the wikiup. The poles of the frame was lashed together with tough yucca fibers and bound together at the top. Sapling hoops (ribs) were then fastened over the frame. The frame was then covered with sagebrush, willow, bear grass, branches, big bluestem grass, leaves, and bunches of grass (brush). Woven mats, hides, canvas and blankets also covered the wickiup if these were available, kept in place by ropes and poles. Space was left for a doorway with an entrance flap that allowed people to creep into the wickiup. A smoke-hole at the top of the wickiup allowed smoke from the fire to escape, and fresh air to circulate. The Apache house was called a 'kowa' and the Apache words for doorways or entrances were 'd�itin' or 'chogunti'.